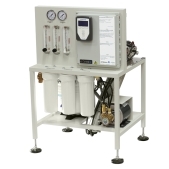 Designed for DriSteem equipment and stand-alone operation, the RO-200 Series reverse-osmosis water treatment system significantly reduces or eliminates maintenance on downstream equipment by removing over 98% of dissolved solids from supply water. The Vapor-logic® controller in our compact 200 Series reverse-osmosis water treatment system provides menus for all system functions, with a web interface, and integrates with Modbus®, BACnet®, and LonTalk® building automation systems. The DriSteem RO-200 system includes a built-in TDS sensor that sends notifications to the BAS system when the total dissolved solids concentration rises too high, ensuring continued system performance. High-efficiency, extra low-energy membranes use little energy to generate pure water. Pull-up membrane cartridges save space and make membrane replacement easy.